thank you VERY much, power iso works like a charm.. as you say.. its very difficoult to mount an iso image in windows 7.. btw, if you click on computer then (right click), manage.. you can create virtual drives with windows 7.. but, for example.. the ISO extension is not supported. Thanks, I have been looking for a good mounting software that worked on Windows 7. Later do0d. I used MagicIso with Vista but when I tried with Windows 7 it completely locked up. Then, every time I tried to reboot, it locked up Windows 7 Booting up. I had to reinstall Windows, ugh. Thanks again for the advice. Power ISO doesn’t seem to work now on Win7 version 7127????? Tomyem … go on thepiratebay.org and look for “daemon tools windows 7”. There is a version with the SPTD made to work for Windows 7. Not sure about version 7127, but I’m using Daemon Tools on Windows 7 RC. What’s the problem with MSFT, is it so diffcult to support .iso files out of the box ? Why OSX can do it with .dmg files. Do we have to wait till Windows 12 ? MSDN provides all the software on .iso and their own OS doesn’t support it. Sure the same company ? thanks mate, didn’t try it yet but it seems fantastic to find something i needed. bye ! 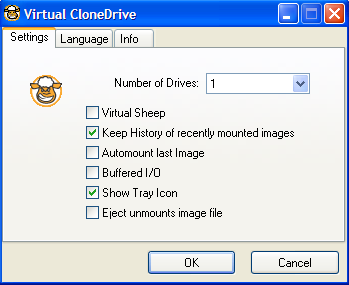 Try SlySoft Virtual CloneDrive as well. It’s free. Daemon tools is OK now. Good old pirate bay. I hate to think what people had to do before torrenting. MagicDisc works fine with Windows 7.
just because it says so on the website that doesn’t mean anything. I installed Magicdisc last night on a fresh / updated windows 7 system. Every time I shut the system down after that … it bluescreened. Uninstalled it, and the error is gone. The problem is that M$ aren’t allowed to add basic functionality without hitting anti-trust suits. Any other OS is allowed to ship with a built-in web browser, Windows isn’t. They were ready to add AntiVirus – it got blocked. I’m told (by an employee) that the code for mounting almost all formats of disc image was wrtten and ready to go in before they had to pul that too – the list is endless. Put simply, don’t blame M$ for most “missing” features, blame the politicians that are taking the bribes from the other OS writers to block them. I used Microsofts “Windows 7 USB DVD Download Tool” to “burn” to USB. It’s not for that purpose, but… It makes the USB bootable, but what… The process ended with reporting error, but everything was there. Thanks! I thought there is no way to mount ISO file on Windows 7. So I was going to change my system back to Windows xp. But Power ISO works fine. So Microsoft is a megalomaniac company out to conquer the world and build huge monopolies, in which their inferior software lives best. They don’t like competition and that is why they stamp it out wherever they can, usually with unfair and powermongering tactics. Go read the biography of Microsoft and Gates, it is a great read and opens the eyes, especially to all the lovers of MS that think it is such a great company and that other companies died because they just had to and were weak. Cowardly and treacherous murder is a better word describing it. They got no ethics and no morals when it comes to stealing other companies ideas and then bankrupting them. They have been successfully been able to prevent Ubuntu from being preinstalled by a lot of OEMs and offering an alternative to Windows. This is face, not a theory or anything. There are payments from MS to the OEMs for that and NDAs. They know that Ubuntu would make WIndows look bad (because too expensive, the price would show directly. And like any other company that peddles their overpriced wares (like the cellphone industry), they must hide the price so that nobody can see how expensive it is. That is why the EU is trying to halt their advance and their monopoly. WINRAR is the EASIEST WAY!!! If all you need to do is extract the contents of an iso file you can use 7-zip, it’s a good freeware alternative to WinRAR. I AGREE.. WinRar is the Easiest way… but It’s the most CRAZIEST THING TO DO. There’s a lot of SOFTWARE that can mount ISO files. When you use WinRar another SPACE of your HARD DRIVE will occupy upon extracting.. but If you use PROGRAM like POWERISO it will just mount to another drive without occupying another hard disk space. Use any program for ISO i RECOMMEND POWERISO to make it easier. your total CONSUMPTION 9GB how about if the scenario you have 12 gb remaining from start..
1. You can just imagining you have inserted another drive. 2. IT’S READ ONLY – Anti Virus can never delete your VIEWED FILES. DAEMON tools lite (freeware} works fine on 7. I have it on 3 computers. NERO 6. was great but they eliminated the mounting function on 9, which only works on 7. I guess DVD companies don’t want us to mount any more. With 3 terabytes who needs a disc? @xtc Said, try reading the post yourself, boofhead, they are wanting to MOUNT the ISO, not Burn it…. Windows Disc Image Burner, very name should have told YOU that..
let me summarise for you…. WinISO is good for me, I was able to mount the image files with less minutes.